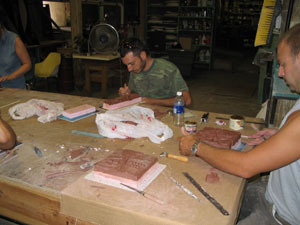 I went to Ed Hoy's in Chicago early in June for a casting workshop with Jayne Persico. 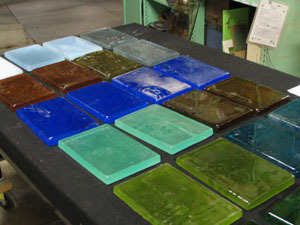 Through July and August, I spent time at Fred diFrenzi's studio in Louisville, also learning glass casting techniques. 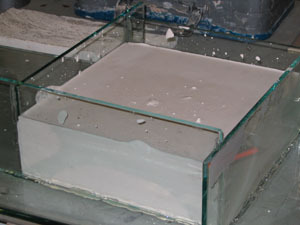 With Jayne Persico, we made a wax model and invested it in Hyroperm plaster. 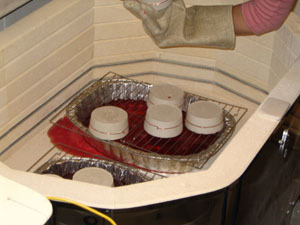 The red wax was melted out of the mold in the kiln. 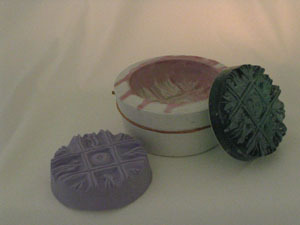 We then cast a silicone rubber positve (purple, in the photo). 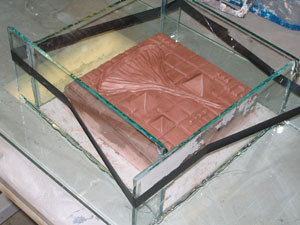 Finally, sheet glass was cut and the mold filled, then fired (greenish piece in the photo). at the Louisville studio of Fred diFrenzi. 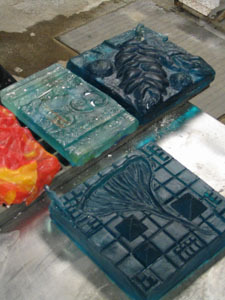 The process involved making clay models, casting them in Hydocal/silica investment to make a mold, then loading the molds with pieces of dalle glass from Kokomo Opalescent Glass, and firing. 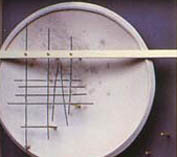 The finished castings (below left) are one to three inches thick. 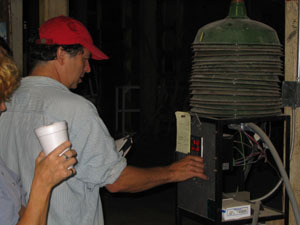 I plan to continue working with Fred (below in the red hat) this fall (2006) and later.